Tomorrow we’re participating in the 3rd annual Funky Chicken Coop Tour. Our coop and our ladies will be a stop on the tour (lucky number 13, if you’re looking on the official tour map). Come say “hi” if you’re in Austin! If you’re checking out this post after the tour – thanks for visiting! We’ll be posting more chicken related content in the next few days, including pictures from the tour and exclusive interviews with both Teriyaki and Dumpling about their tour experience. In the meantime, you might be interested in some chicken info and resources. The plans we used to make our coop are from Catawba Coops. The plans were well worth the $20 we paid for them – they include a very detailed shopping list for all the lumber and hardware we needed as well as really detailed cut lists (two things that other plans we looked at lacked). Our hens are Buff Orpingtons. Friends of ours from Green Pocket Farm in Red Rock raised the ladies from chicks. We got them as young hens, or pullets, a month or two before they were laying their first eggs. Of the mixed bag of chicks that our friends raised, the buffs were the most friendly with humans and the most bossy with the other birds. Now, we joke that Dumpling and Teriyaki are the “two-headed-chicken” because they’re often right next to each other doing the exact same thing. Some times, when one of the girls is upstairs laying, the other hen will wait downstairs and squawk out of, what appears to be, loneliness. Yes, it’s annoying, but it’s also kinda sweet. We get most of our supplies and food from Buck Moore Feed. It’s a great local store with knowledgeable and friendly staff. If you’re in Austin and looking for chicken resources, go there! They’re also selling chicks now – they had lots of buff-orp chicks today, as well as some Black Australorps, Dominiques, and Rhode Island Reds. If you’re looking for an even more incredible chicken field trip, make plans to visit H&H Poultry in Burnet. They have beautiful and unique chickens and an amazing flock of guineas. Guineas are super cool and prehistoric looking – it’s like visiting Jurassic Park! 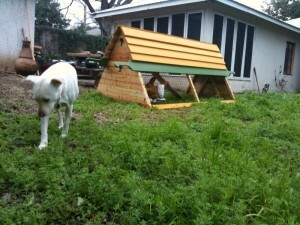 The BackYard Chickens website has most of the info any person would want about raising a small backyard flock of hens. Leave a comment if you have any specific chicken related questions and we’ll answer them in an upcoming post. View all posts by Emily . Subscribe to follow comments on this post. Add your thoughts or trackback from your own site. © Copyright 2007 ATX DIY . Thanks for visiting!